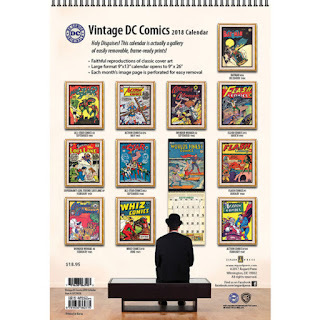 Each month I write about the comic behind the cover featured that month in the 2018 Vintage DC Comics Calendar from Asgard Press. The June entry is Superman's Girl Friend, Lois Lane #7, cover date February, 1959 with a cover by Curt Swan and Al Plastino (note: some online sources peg the inker as Ray Burnley, but my copy of Showcase Presents Superman Family gives credit to Plastino, so that's who I'm going with). I've already discussed Curt Swan back in the Tales of the Calendar for Action Comics #276. Depending on your age, he is the Superman artist, drawing the character for a solid 38 years before giving way to John Byrne. Al Plastino was another prolific Superman artist, particularly noted for co-creating (with Otto Binder) Supergirl, Brainiac, and a certain group of pesky teenagers from the 30th Century. Two legendary Superman artists just on the cover alone! And then when you open up the book, you find two more legends on the inside. But more on that later. When Lois Lane #7 hit the stands, it was a relatively peaceful world (especially compared to all those books we've covered that came out during a world war), but one in transition. Fidel Castro took over Cuba. Alaska became the 49th U.S. state. The Soviets launched Luna 1, the first spacecraft to approach the moon and the first to leave geocentric orbit (though completely by accident). Barry Gordy founded Motown Records. Unfortunately, that change wouldn't come about for Lois just yet. While she started out a go-getter reporter who loved taking on crime and eventually would become a Pulitzer Prize-winning author (and super wife and mom), in between those points in her existence, the typical Lois Lane story featured our heroine trying to figure out Superman's secret identity, try to get Superman to marry her, or just otherwise moon over him. Her reporting skills were often reduced to puff pieces. Sadly, all of this is in evidence in this issue. Farewell, Fido. We barely knew you. The first of three stories in this issue, "Lois Lane's Kiss of Death" sees Perry White giving Lois the incredibly important assignment of coming up with a new angle on superstitions for their Friday the 13th issue. Lois visits the museum, where a headpiece of the ancient Egyptian "queen" Isis (DC Comics was not the place to come for a lesson on ancient history -- or mythology, for that matter -- back then), which was said to curse anyone who wore her crown to develop a kiss of death (and they meant it literally). Lois of course plops the thing on her head the first chance she gets. And of course the dog that is the first thing she kisses (please, no judgement here folks, this is a safe zone) is immediately killed by a car. Lois kisses a couple of other strangers, and they seemingly meet their fate as well. The story climaxes with Lois kissing Superman to his doom, except it turns out it's not Superman but a crook wearing a Superman mask that would apparently put Ethan Hunt to shame. 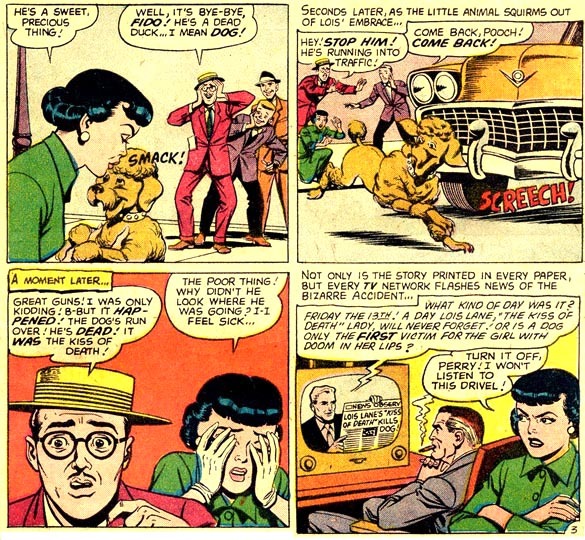 Superman swoops in to save Lois, reveal all the chicanery she was subjected to (turns out everyone she kissed was actually still alive and in hiding, everyone that is but the dog who needed to stay dead for crossing the species boundary), and get his own kiss. High drama indeed. "Lois Lane's Kiss of Death" was written by Robert Bernstein and drawn by Kurt Schaffenberger. Bernstein, like many writers of the era, worked in a number of different genres. He wrote westerns for Atlas Comics and war comics for both Atlas and DC. 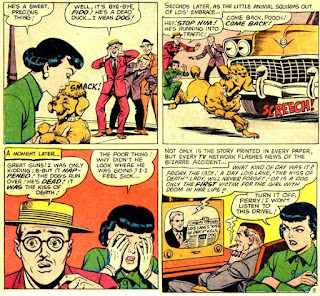 For Archie, he created the superhero the Jaguar. For DC, aside from many Superman and Superboy stories, he created Aquaman's origin and created Aqualad and Aquagirl. He also helped turn the Golden Age character Congo Bill into Congorilla. When he wasn't writing comics, he was spearheading a concert series that last from the 50s into the 80s and brought classical music, jazz, dance, and theater to the unsuspecting natives of Long Island. He also wrote a series of one act plays that appear to have never been performed until after his death. Kurt Schaffenberger is a minor legend among Superman artists. He started work in comics in 1941 on Fawcett characters like Captain Marvel, Bulletman, and Ibis the Invincible. He moved on to other companies, but didn't end up at DC until 1957. He stayed with the company for 13 years and became noted for Superman, Superboy, and particularly Lois Lane, before being fired for trying to organize artists to protest working conditions. He was hired back two years later, however, and would stay with DC consistently until he was largely purged along with most older talent (such as Curt Swan and Carmen Infantino) after Crisis on Infinite Earths. His Lois Lane and Superboy are probably what most fans from the Silver and Bronze Age think of when discussing those characters. "twice beheaded". That might explain those eyes. Jeez. The second story, "When Lois Lane Forgot Superman", is a classic example of how much mainstream media misunderstood hypnosis. 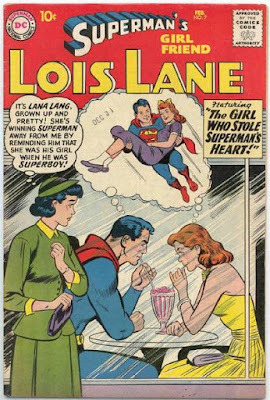 In this pretty forgettable tale, a lovesick Lois decides that she needs a vacation to get away from all of the reminders of Superman that has her depressed because she's so unworthy of him. However, she's asked to do one of her typical hard-hitting pieces (that's sarcasm, in case you didn't guess) on a local renowned hypnotist. She visits Dr. Hyman Zweikopfen, who uses his large unblinking eyes and a swinging light to make her forget all about Superman. The hypnosis succeeds, and not only can't Lois stand Superman when she finally meets him again, she decides that her type of man is really the nebbish Clark Kent. She shows her attention in her usual coy way, physically handcuffing the two of them together as part of an invitation to a dance (because that's just how Lois rolled back then). Clark's driven to such annoyance that he reveals his secret identity to her, shocking her out of her hypnosis and (of course) causing her to forget everything that happened while she was hypnotized. Magic reset button to the rescue! No one apparently wanted to take credit for this incredible piece of art Americana, as neither my collected edition nor any of the websites I checked had a clue who wrote it. However, the art was recognizably Wayne Boring, with inks by the aforementioned Stan Kaye. 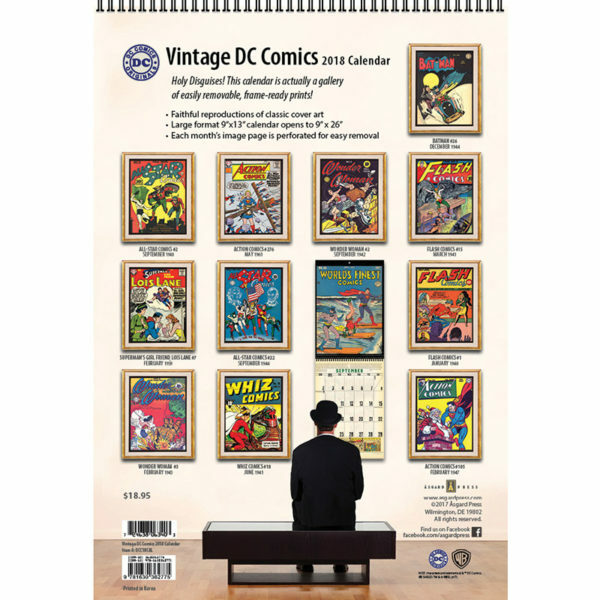 He began his comics work in 1937 working for Jerry Siegel and Joe Shuster. He would be hired directly by DC in 1942, and in 1943, he and Stan Kaye would form a Superman art team that would remain active for the next twenty years. Boring's Superman was the canonical late Golden Age version of the hero, with strong jaw, barrel chest, and the acute angle in which Superman would land from flight. He would eventually be released from DC in 1967 during one of their periodic purges of older talent. He would stick around comics for a few more years before retiring and becoming a bank security guard. He would only pencil a handful of titles afterward until his death in 1987.
sprayed by ashes with the one you love. The final story, "The Girl Who Stole Superman", was the first of a series of tales in Lois Lane in which an adult Lana Lang and Lois Lane would fight (or seem to fight) over Superman. This first tale has Lois visiting the slums for a story and seeing Lana in line at a soup kitchen. Lana's fallen onto hard times and didn't want to ask Superman (nor her old friend Clark Kent apparently) for help. Lois decides to take her in, and in reward, Lana offers her the ring that Superboy made for her back when they were dating as teens. 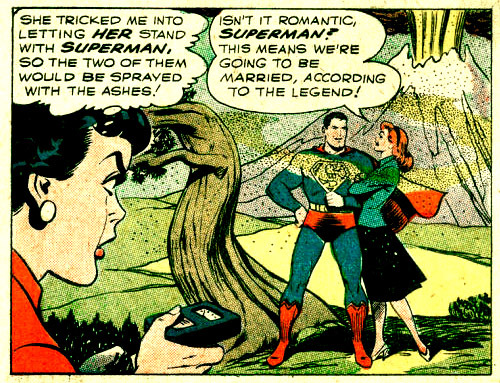 Lois refuses, but of course makes sure to mention it to Superman, who makes her a ring as well. Almost immediately, though, Lana seems to start getting in the way of romance between Lois and Superman, and what's more, Superman seems to be into it. After several events in which Superman seemingly rubs his attraction to Lana in his girlfriend's face, Lois takes off the ring and throws it at the (at that moment kissing) duo. It's at that point that the two reveal to Lois that it was all a ruse to get Lois to voluntarily give up the ring because it was made of unstable material and was due to explode at any moment. They felt they had to put on this act because of course Lois is too immature and unbalanced to respond well to Superman saying something like, "Gee sorry, Lois, but that ring I gave you might explode. so how about I take it back and make you a new one that won't kill you?" Mort Weisinger's Superman and Lois Lane, everyone! This incredibly respectful story of strong women was written by Jerry Coleman and illustrated by our old friend Kurt Schaffenberger. Coleman wrote for DC throughout the 50s and 60s, primarily on various Superman and Batman titles. His most noteworthy creation was the introduction of White Kryptonite. battle, ergo power is half the battle. Besides the Lois Lane features, the book was padded out with some of DC's usual filler. Varsity Vic and Little Pete, both of whom we've talked about before, make an appearance. Boltinoff did a huge number of these humor strips, including the legendary Super-Turtle, last son of Galapagon. With such creations as Casey the Cop, Cora the Carhop, Freddie the Frogman, Hamid the Hypnotist, Honey in Hollywood, Jerry the Jitterbug, King Kale, Lefty Looie, Moolah the Mystic, No-Chance Charley, Peter Puptent, Sagebrush Sam, and Warden Willis, Boltinoff singlehandedly inspired every Stan Lee character name ever. 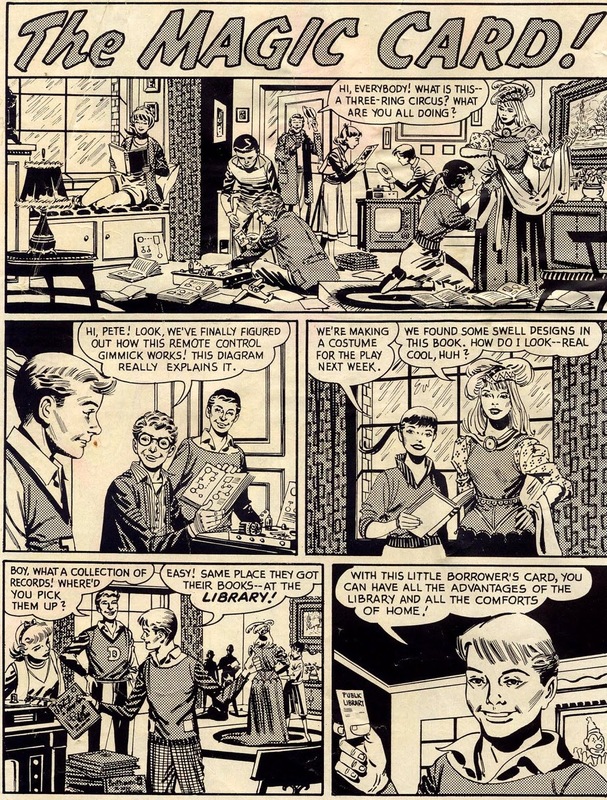 In addition to the Boltinoff funnies, Jack Schiff shows up with a public service announcement, this time on the evils of reading books from the library. Wait, no, this time it's on the benefits of doing something, that something being reading books from the library. When Schiff wasn't writing single page comics to live by, he was editing Batman and inventing Starman and Tommy Tomorrow. 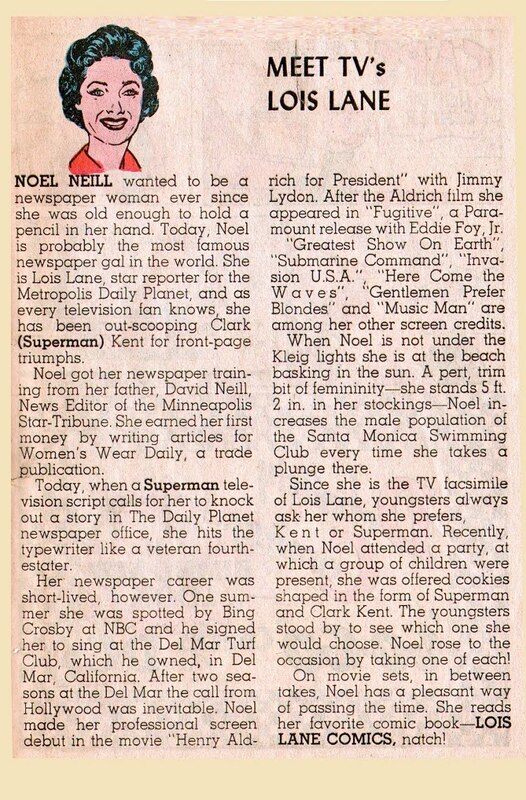 Another page was devoted to a text piece titled "Meet TV's Lois Lane" providing a quick bio on Noel Neill, who played Lois on the Adventures of Superman television series as well as in the Kirk Alyn film serials. The writeup notes Neill was the daughter of a journalist and writer of articles for Women's Wear Daily. While it covers her film and singing careers nicely, it does omit her time as a leading pinup model (second only to Betty Grable when it came to popularity during World War II). And of course it fits in a plug for the Lois Lane comic series. Sadly, her career petered out after the Superman series ended. While her pre-show filmography is packed with various femme fatale, damsel in distress, and plucky girl roles in movies and television, her post-show credit include a cameo in the 1978 Superman movie, a part in the 1991 Superboy series, a spot in Superman Returns, and a couple of minor roles. She did enjoy working the convention and college circuits, though, and fans found her largely accessible. She passed away two years ago at the ripe age of 95. That's it for this month's calendar page. I'll be back next month with a write-up on the July page featuring the cover of All-Star Comics #22.